Already in 1857, the Prussian King Friedrich Wilhelm IV, who had revived the Protestant branch of the Knights of St. John, had been interested in the acquisition of "Muristan" in Jerusalem, the founding place of the Order of St. John. In 1869 the Sultan of the Ottoman Empire gave the eastern part of the Muristan to his friend, King Wilhelm I of Prussia. The German Protestant Church of the Redeemer was built in this location from 1893 to 1898. In the mid 19th century a policy of liberal reform had begun in the Ottoman Empire, which led to the opening up of Palestine and the presence of Europeans in the East. Missionary societies settled in Jerusalem, and on the initiative of King Friedrich Wilhelm IV a common diocese with the Anglican Church of England was established here (1841-86), together promoting the recognition of Protestantism as a separate religious community in the Orient. In building the Church of the Redeemer in the Muristan in 1898, the German Kaiser Wilhelm II created not only a monument of Protestantism in the immediate vicinity of the Holy Sepulchre, but also a national monument. The building was thus part of his quest to gain international standing for the German Reich by being a peaceful influence in the Orient. The media-friendly tour of the imperial couple to the inauguration of the church on Reformation Day in 1898 was also in aid of this goal. The "Kaiserfahrt" was treated with suspicion and ironic commentary by the major European powers. The Church of the Redeemer was built on the groundplan of the Crusader-era Church of St. Maria Latina. The neo-Romanesque design by the architect Friedrich Adler used the previous building as a model. 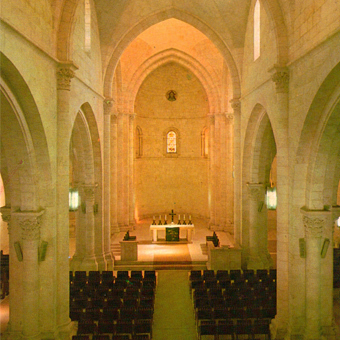 The original interior of the Wilhelmine church was radically changed during renovations in the 20th century. The altar and pulpit were removed, along with all paintings and mosaics on the walls and the dome. Today only one Christ mosaic and the window in the central apse remain of the earlier design. The Church of the Redeemer was the religious centre of the German Lutheran church in Jerusalem, which was in large part made up of employees of the many social institutions of German missionary societies. As a result of the political events of the 20th century, many of the facilities were closed temporarily or permanently; some of them now exist in other places. At the Church of the Redeemer today there are four lively Protestant communities that hold their services in German, Arabic, English and Danish. Documents, photos and souvenirs of the "Kaiserfahrt" demonstrate to the visitor the emergence of the German Lutheran church in Jerusalem and the brilliantly staged opening of the Church of the Redeemer. Historical maps, photographs and remnants of the interior decorations give an impression of the architecture of the Church of the Redeemer and the change in its appearance in the 20th century. The history of the German Protestant bodies up until today can be traced on a large map of Jerusalem.